Our Gaming Friday deals roundup includes some of the best gaming laptops, gaming titles, monitors and more, which are being offered at a discounted price or with a considerable cashback. Paytm Mall is hosting a gaming Friday deals sale and is offering a plethora of products at a discounted price. 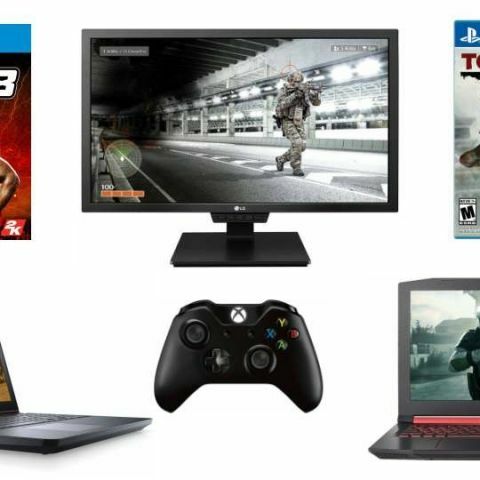 We have rounded up some of the best deals available, which include gaming laptops, consoles, monitors, gaming titles and more. The Acer Nitro 5 laptop is powered by 7th Gen Intel Core i5 processor and comes with 8GB RAM and 1TB of internal storage. It is equipped with a dedicated Nvidia GTX 940MX GPU and features a 15.6-inch display. You can check it out here. The Dell Inspiron gaming 5577 laptop is powered by the 7th Gen Core i5 processor and features 8GB DDR4 RAM with 1TB HDD. It is equipped with the Nvidia GTX 1050 GDDR5 GPU and comes with a 15.6-inch display. You can check out the laptop here. The MSI gaming laptop is powered by the 7th Gen Core i7 processor, coupled with 8GB RAM and 1TB of HDD. It also sports 4GB Nvidia Geforce GTX 1050 GDDR5 GPU and features a 15.6-inch display. You can buy the laptop here. The 1TB Sony PS4 console comes bundled with two games, The Last Of Us and the latest installation of the first-person RPG, Uncharted 4. The console supports WiFi, 2x USB and 1x HDMI connections as well. You can check it out here. The 24-inch LG gaming monitor features a full HD resolution and comes with a 5ms response time. It is an LED display with 27W rated power consumption and comes with a three year warranty. You can buy it here. The Samsung curved LED monitor features a 26.5-inch display and boasts of a 4ms response time. It features a full HD display resolution and covers 72 percent of the colour gamut. You can buy it here. The 24-inch LG gaming monitor features a 144Hz refresh rate and comes with a 5ms response time and 1ms motion blur response. It supports full HD display resolution and has a three year manufacturer warranty. You can check it out here. The Wireless Sony DualShock 4 controller supports Bluetooth 2.1 connectivity and comes with a 1000 mAh battery. You can buy the device here. The wireless controller for Xbox One boasts of up to 30 feet of wireless connectivity range and features 2 pressure-point triggers and an eight-way directional pad. You can buy it here. The WWE series of gaming titles need no introduction. The simple go to play genre has kept evolving with the times but lost the charm as compared to the first few titles. The last year’s release is also a good buy and will keep you and your friends entertained for hours. You can buy it here. The long legacy of Tomb Raider series was rebooted in 2012 by Square Enix and boy, did it sweep us off from our feet. There was not a lot going on in terms of storyline but the gameplay mechanics, updated graphics and overall enthralling gameplay kept us hooked. You can buy the gaming title here. One of the best games for PS4, Uncharted is being offered as a bundle where you can get the first three installations of the franchise at a discounted price. There is also a s 200 cashback to sweeten the deal. You can buy it here. The sort-of spin-off of the Uncharted universe is the Lost Legacy, where one doesn’t play as Nathan Drake but the side characters who were present in the older games. Nevertheless, it is an action-packed game, which will leave you longing for more. You can buy it here. The final Uncharted installation in the gaming franchise is as we said, “If you have played the previous games in the franchise, you will have undoubtedly played this one already. If you are new to the franchise and haven’t played the previous games, relax. You will enjoy this nonetheless. Just for the visual treat, this game is worth your attention. It’s the Indiana Jones adventure we’ve been waiting to play.” You can buy the title here. which is best processor i5 or i7 for gaming laptops ?